← Herbs & Spice Make Everything Taste Nice! 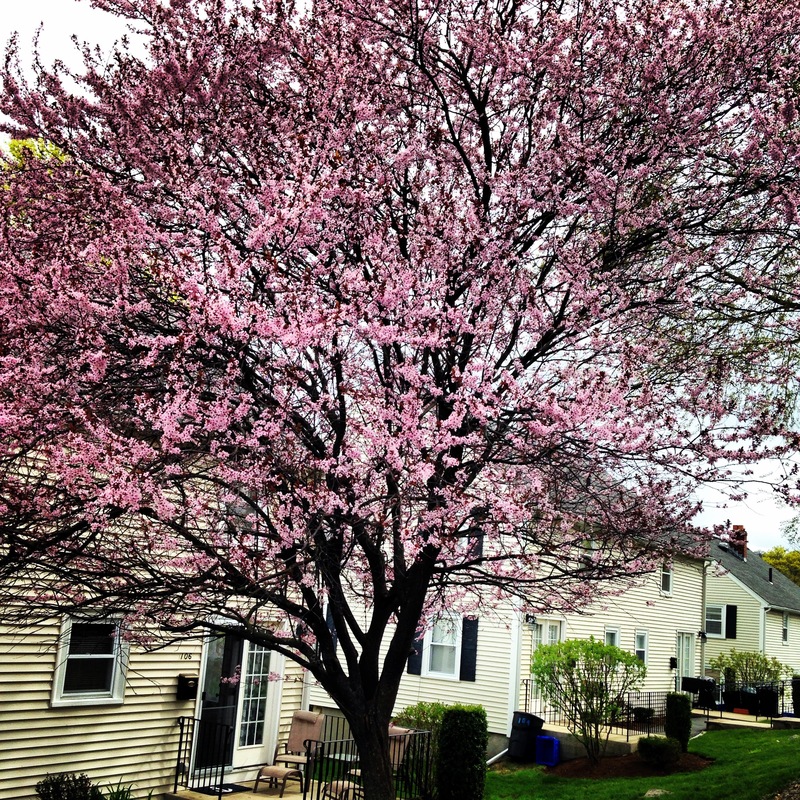 Finally you can sense spring is in the air, and if you lived in the Northeast it is has been a long time coming! Spring is all about renewal and for many of us the winter might have put us in a funk around making time for our wellness and caring for our bodies. Maybe you have woken up from your winter haze and the scale has tipped in the wrong direction, or you’ve stopped exercising, or your spring wardrobe is all of a sudden a little snug or ice cream and cookies are a daily occurrence rather than a once and awhile treat. This is not the time to panic, beat yourself up and dwell on the woulda shoulda coulda of this past winter. Spring is about looking forward. Sometimes the first step to pull yourself out of that winter haze is baby steps. There is no need to take a huge overhaul of your wellness, rather to start making small changes. Many of my clients have come into my office, overwhelmed with their goals and are paralyzed because they just seems so impossible. I tell them the only way to move forward is to take small steps, so we pick one maybe two small changes to work on for 3-4 weeks. Those small changes serve as an entry point back to wellness and create momentum for them. And there is actual research to back the importance of small steps or changes. Annals of Behavioral Medicine found that participants who made one small, potentially permanent change in their food choices and/or physical activity each week (such as drinking one fewer can of soda or walking 5 more minutes each day) lost more than twice as much belly fat, 2½ more inches off their waistlines, and about 4 times more weight, never mind all of benefits of feeling great and confident when you care for yourself. So what is going to be your entry point back into wellness? 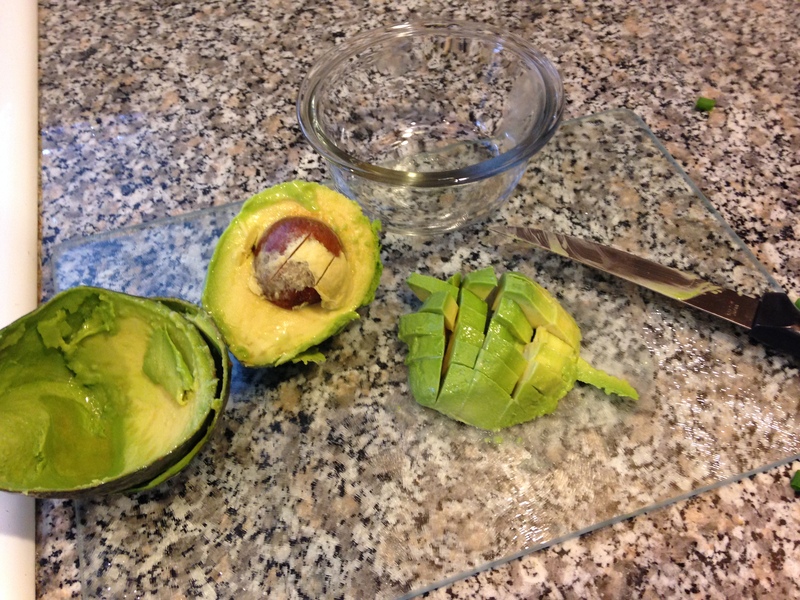 For many of you it might be starting off with making a very simple and healthy meal for yourself. May a suggest my Spring into Spring Salad. This is a fantastic salad because it requires no cooking at all, but the flavor combinations “pop” in your mouth and leave you nothing but satisfied. Challenge for this week is to think small and make one change or one meals to start to create momentum back towards wellness! Step 1: Prepare beans with dressing to allow to marinate. Strain and rinse Cannellini beans. Combine olive oil, lemon juice and fresh herbs, whisk until combined. Add Cannellini beans and allow to marinate for 15 minutes. Step 2: Chop baby cucumbers and scallions. Cube the 2 avocados. 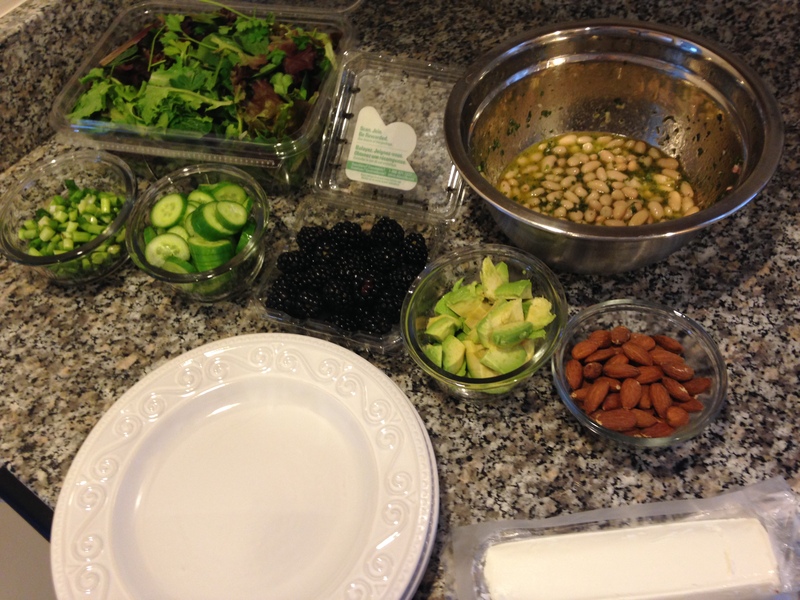 Steps 3: Create an assembly line of all ingredients to create salads. Combine lettuce, cucumbers, scallions and avocados. 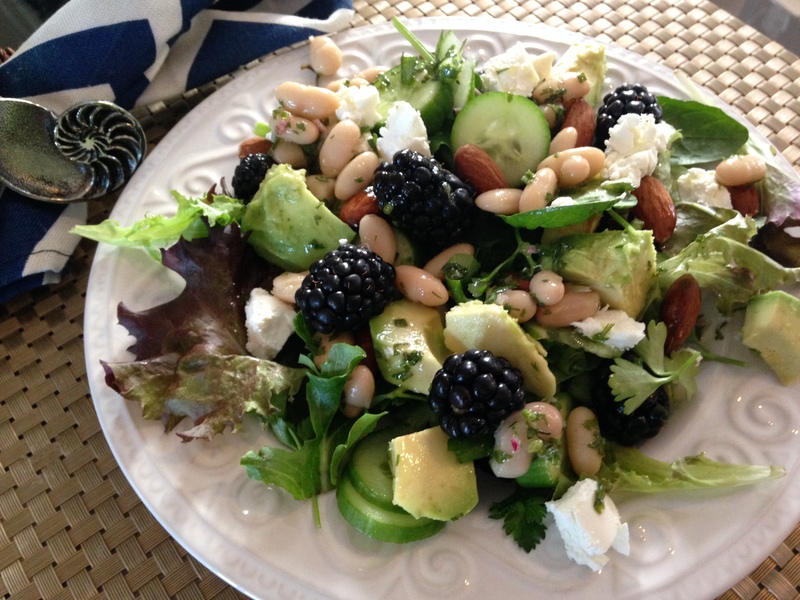 Add blackberries, almonds and crumbled goat cheese. 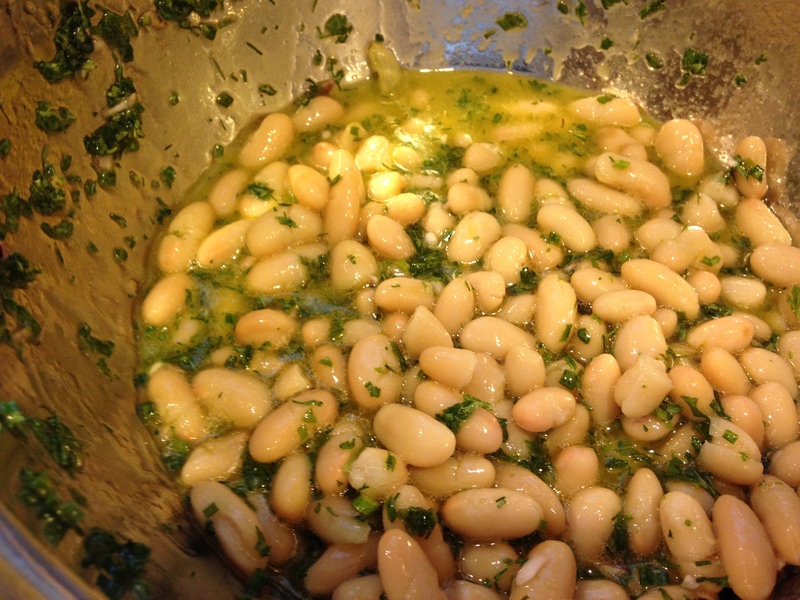 Step 4: Top with marinated Cannellini beans and enjoy! 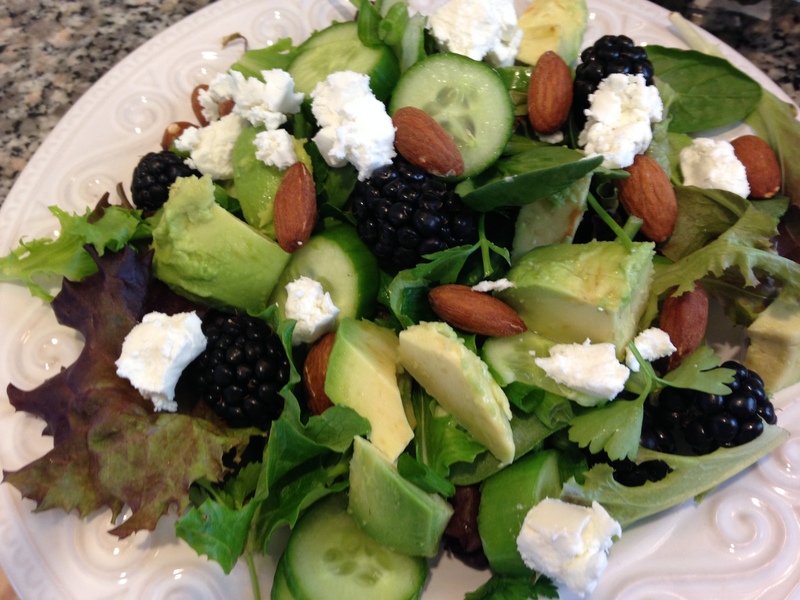 This entry was posted in Lunch, Meatless Mondays!, Planning, Quick & Healthy, Self Care, Uncategorized and tagged Cooking, food choices, Homemade, Quick, vegetables, weight health, Weight loss. Bookmark the permalink. 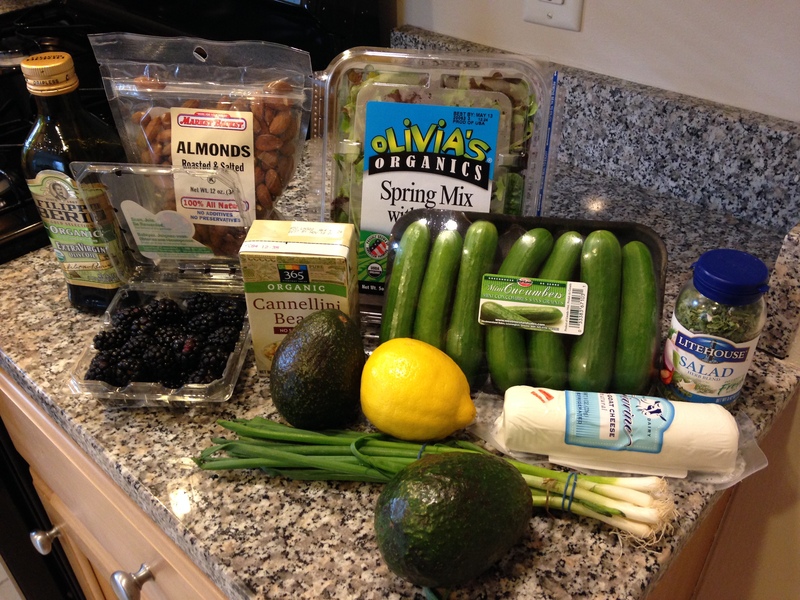 1 Response to Spring into Spring Salad… Quick & Healthy!